The Corduroy Brook Children's Nature Camp for ages 4-14. It is a fun and exciting camp that takes place through July and August. Running through the heart of Grand Falls-Windsor, the Corduroy Brook Nature Trail offers a relaxing wilderness experience for all ages and abilities. With many rest and park areas and an abundance of wildlife, you are sure to take pleasure from the experience. Located at the trailhead, the Corduroy Brook Nature Centre will soon be home to a wetland interpretation centre! The Corduroy Brook Enhancement Association (CBEA) is a non-profit, charitable organization committed to restore and preserve Corduroy Brook, and to build and maintain a system of accessible nature trails along its course. The Association was incorporated in 1994 and now boasts over 20 kilometres of nature trail, and related infrastructure including bridges and boardwalks, playgrounds, viewing platforms, rest areas, tent sites, and a comprehensive system of signage. The Corduroy Brook Nature Trail is constructed along the course of Corduroy Brook. The Corduroy Brook Children’s Nature Camp for ages 4-14. The Corduroy Brook Enhancement Association is a non-profit, conservation organization and Nature Centre with over 20 kilometres of accessible hiking trails. We use TRAFX Infrared Trail Counters to track usage of the Corduroy Brook Nature Trails. Stay up to date with Corduroy Brook Centre and Nature Trail. We are super excited about this! 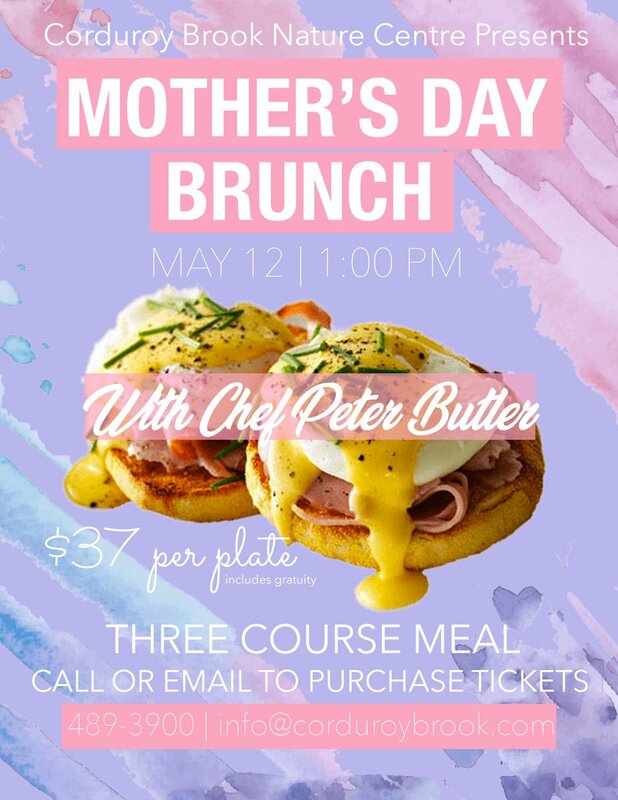 🤩 The Corduroy Brook will be hosting a Mother's Day Brunch (because who doesn't love brunch), on May 12 at 1:00 pm at the Corduroy Brook Nature Centre. Tickets are $37.00 each and can be purchased by calling 489-3900 (Monday - Friday, 8:30am - 4:00pm) or sending an email to info@corduroybrook.com. Corduroy Brook Enhancement Association added 7 new photos.